If you're a marketer, student or non-profit, please read on. I've been kicking around an idea for a while and am finally doing something about it. Non-profit organisations are generally understaffed. They could really benefit from having an extra one or two enthusiastic, smart, hard-working student grads helping them out. I've worked with some marketing grads over the past few years who have been really impressive. They bring energy, fresh thinking and ambition to any project. But charities generally can't afford more people. But what if these students could be paid in something other than money? So, here's the plan. Ambitious marketing students work for free for 20 hours a week for a non-profit organisation. In return, they get training and teaching from some of Ireland's finest marketers. I'm talking about high-end training and workshops that would cost many thousands of euro if clients were getting them. The aim would be to fast-track these students so they are as prepared as possible to pick up marketing jobs. As there are not many marketing jobs around at the moment, brand managers will pick only the best. This training will give these individuals the edge. And of course, it is not just the training, but access and a chance to impress some of the best contacts in the marketing industry. Students volunteer 20 hours a week, giving them hopefully enough hours spare to work in a paying job at the same time. So non-profits get extra help for free. Marketing students get fast-tracked into the profession they want to work in. What's in it for marketers? Well, I've spoken to about 10 colleagues or friends in the industry and every single one of them said they'd help. Of course, the more I find, the more we can help. 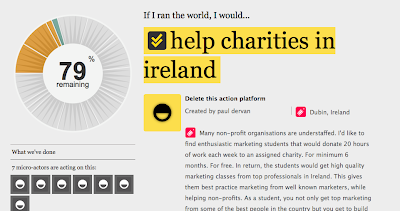 If you're a marketer, student or a non-profit and want to help, pop over to IfweRanTheWorld and look through the details. I'll talk more about IfweRanTheWorld itself next week. Paul, what an amazing initiative and one we can definitely grow into something amazing. Delighted to get involved....and as Ms IfWeRanTheWorld Ireland I am over the moon you chose this as a vehicle to get this initiative going. I work in a small not-for-profit in Dublin and I was looking at something like this to get word of our services out into the community. I don't know if we'd have 20 hours of marketing work a week for someone though, do you think it would be worth thinking about breaking an individual between a few small not-for-profits? hi Conor, I know Alternatives and bumped into of the founders just this week. I'll follow up with her to see if there is anything we can do together. I was thinking it wouldn't have to be 20 hours pure marketing work. Just work. As they'll get their marketing upskilling from the workshops and classes. Ideally they'd get to try out some of their new skills with the non profit but main thing is they help out getting stuff done. But your suggestion might work too - having a student work in more than one place. Well, consider yourselves signed up. I've dropped you an email. Thanks Conor. Well done on this initiative, it's an innovative approach to integrating skilled volunteering and training. We (Volunteering Ireland) are working on our marketing and communications strategy at the moment, so more hands on deck would be welcome. It would also be good to link in with you on this- see if/how we can help spread the message etc. Hi Naoise, Good stuff. Probably several ways we can help eachother. Will you drop me a mail with your number and I'll call you? To DO next even! Trigger happy because we are very enthusiastic about this over here in sunny Smithfield. You should check out a friend of mine - @benrmatthews - on twitter - he runs http://brightone.org.uk/ which is along the same lines. Fantastic service and resource and really taking off there. 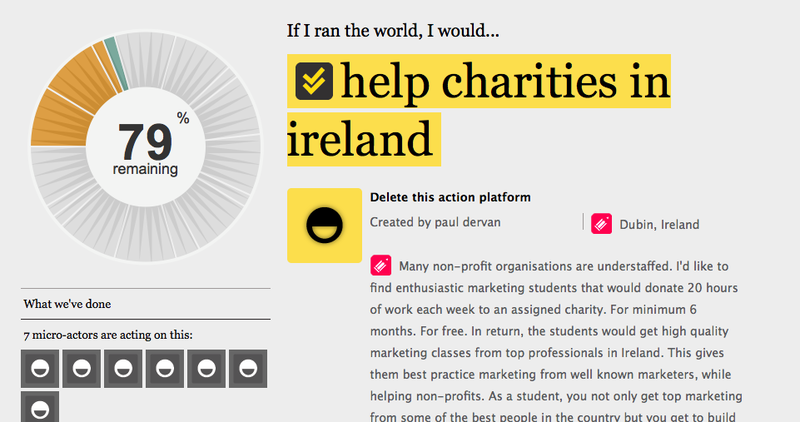 I'd love to be involved with an Irish initiative like this so if there's anything I can do, give me a shout! The College I lecture at have offered classrooms for this! also about 40 students would love to volunteer however the 20 hours a week is a bit too long on a regular basis with their workload... any possibility of working out a volunteer time around less hours but maybe concentrating them in teams around projects? Hi Frances, drop me an email with your details and we'll chat. @darragh - thanks for the link. I'll check out. I'd be keen for you to get involved if you have time. You were on my hit list, as I know you've helped other charities. Would you teach on community managing or something digital? Where are the opportunities for students looking for jobs in this area? I'll drop you a mail. @lucy - that's great. We'll take your classrooms. Where are they? I'll call you to chat about your students. I'm sure we'll find a way to work it into the plan. Paul - coming next week, custom urls so you can 'brand' your actionplatform as www.ifwerantheworld.com/anythingyouwant...will alert when deployed! Hey Paul, replied to your email there dude :) Great to be part of it! thanks Barry. I'd be delighted if you'd join the list of marketer offering to teach? I'd be happy to help you with this and I am actually running training courses too. Great idea. I'm involved with a not for profit currently looking for marketing/webmaster/ design skills so would be very interested in participating. Think we could offer some really good experience as we need to develop a full marketing strategy plus automated CRM. We've already prepared a discussion paper on the issues we need to address. We have no offices though. will this be a problem?